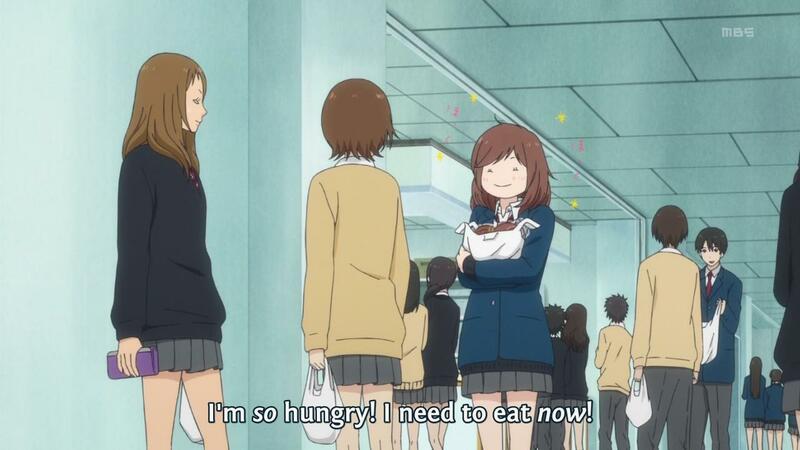 One of the reasons I keep chugging along with this blog is that it enriches my experience with anime. Yes, I sometimes feel forced to watch series I’d rather not – cough, cough SAO II – to stay aware; but, that’s more than balanced out by the positives. 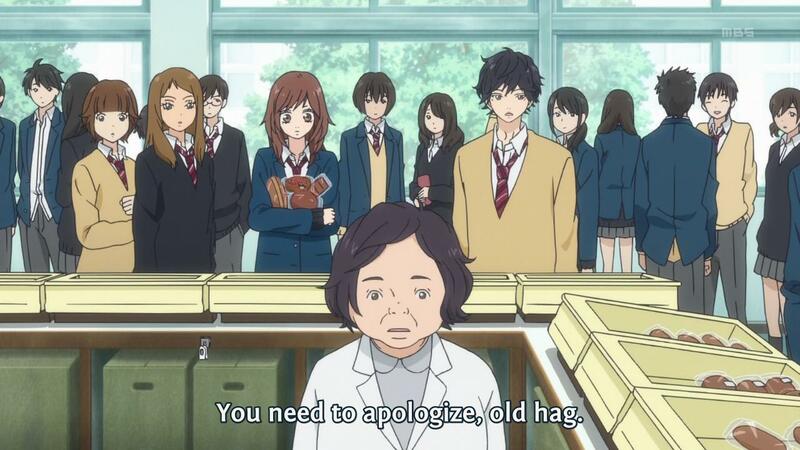 For example, a hesitant recommendation by a commenter on my summer season preview post convinced me to give the shoujo series Ao Haru Ride a shot. 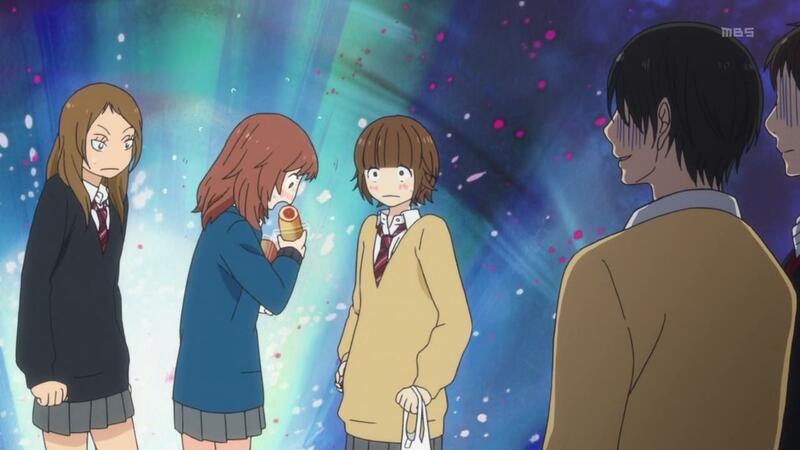 Given the title of this post, I can’t pretend the result of this trial is a surprise but pretend anyways and read on to see if watching Ao Haru Ride ended in success or failure. In seventh grade the shy, cute Futaba fell for a soft spoken boy by the name of Kou and everything seemed to going perfectly when Kou asked her to go on a date with him to a festival held during the next school break. However, Kou overheard Futaba’s rejection of another boy’s romantic advances and decided she was also rejecting him as well which lead him to break the date without telling her. 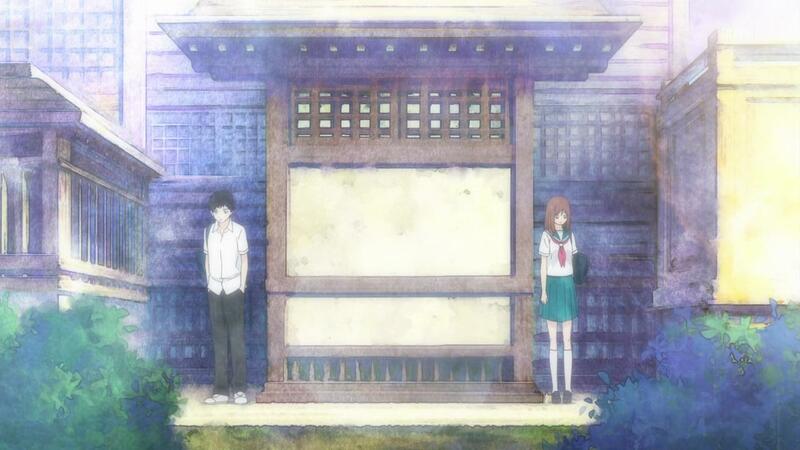 A hurt Futaba was further pained when Kou disappeared (family problems caused the sudden move on Kou’s part). Fast forward three years and Futaba has decided on an image change to a loud, blunt, unfeminine girl because she grew tired of the other girls picking on her because she received all the boy’s attention. Towards the end of her first year in high school she stumbles across a male schoolmate that kinda looks like Kou did and investigates if it’s him or not. It is Kou of course – it would have been surprising if it wasn’t – and a new last name isn’t the only change that has happened to him over the last three years; he has a chip on his shoulder and likes to alternate between being moody and brooding. Futaba sees a chance to go back and restart their budding romantic relationship but Kou quickly responds that things can never be the same again which seems to sink any potential relationship between the two. I wouldn’t say I have an aversion to shoujo, per say. There are a couple of clichés I really, really dislike in the genre – the worse is the glorification of an abusive boy as the ideal that all women should want – to the point I don’t want anything to do with these anime and that shuts me out of 90% of shoujo series (or at least it feels that way). So the biggest hurdle this anime faced to be a series I watch was if it had an abusive main male character or not. 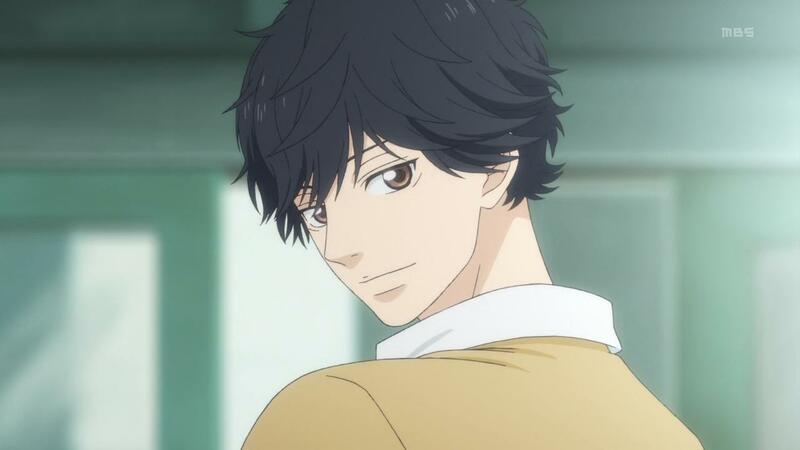 Ao Haru Ride or Blue Spring Ride passed this test when Kou was revealed to have a justifiable level of moodiness from a family situation that was less than ideal but stopped well short of displaying any abusive tendencies that I’d have to worry about. 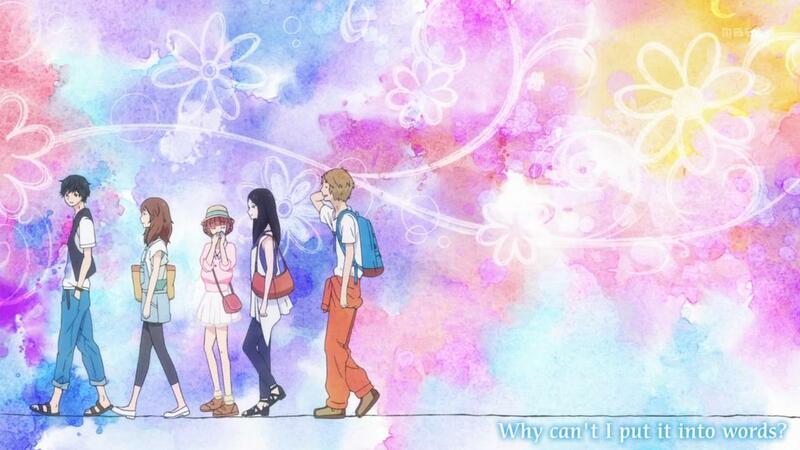 So, with that challenge cleared I could move on to see if Ao Haru Ride is something I should continue watching and quickly found that, yes, I should. The quality of the characters that populate an anime is not dependent on the genre of the anime which is why one cannot categorically discount a whole genre. I might generally like certain themes and tropes of one genre in my anime over another but, at the end of the day; I’d rather watch the show that has better characters in it, unless the other anime has a very interesting story, excellent plotting, and minimally decent characters. (Hence the reason why Aldnoah Zero is at the top so far this season.) Ao Haru Ride has a good, interesting cast of characters that are well thought-out and well put together and are allowed to move the story along based on their personalities and not the writer’s whims. This makes it easy to overlook any problems I have with the genre it’s based in – not that there’s been many problems, Blue Spring Ride has been light on it’s reliance of shoujo clichés. I like Futaba, the main character. She’s solidly within the expectations of what a shoujo female main character should be but I still found myself warming towards her as she attempts to navigate the issues and problems of her life. It helps that I found her problem solving skills very closely aligned with how I’d solve her problems if I was in her shoes. On the flip side, though I want to see Kou drop the façade he hides behind already, I also see and understand where Kou comes from and why it’s going to take time to do so. 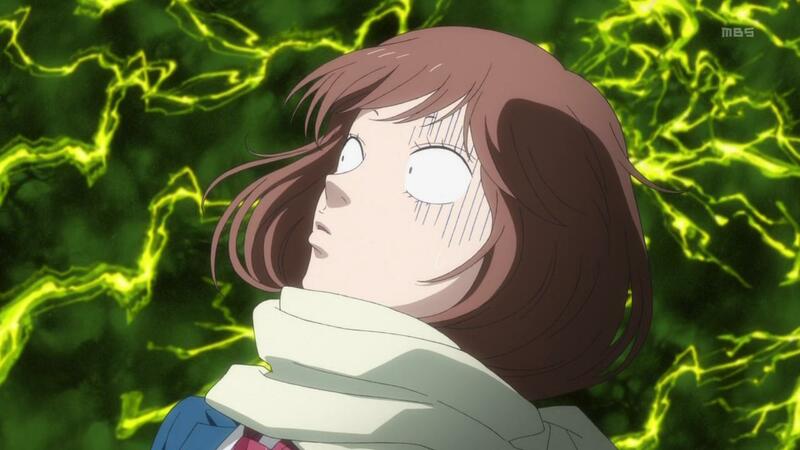 That Futaba and Kou will end up together is a forgone conclusion and one of my other problems with shoujo series is when they drag that conclusion out using the most absurd means to do so. When this happens the show is no longer about the characters but how the conclusion can be drawn out. Therefore, I appreciate that the creators are setting up various side relationships among the web of characters because this will allow a variety of stories to be told and relieve pressure to draw out the conclusion of the main characters. 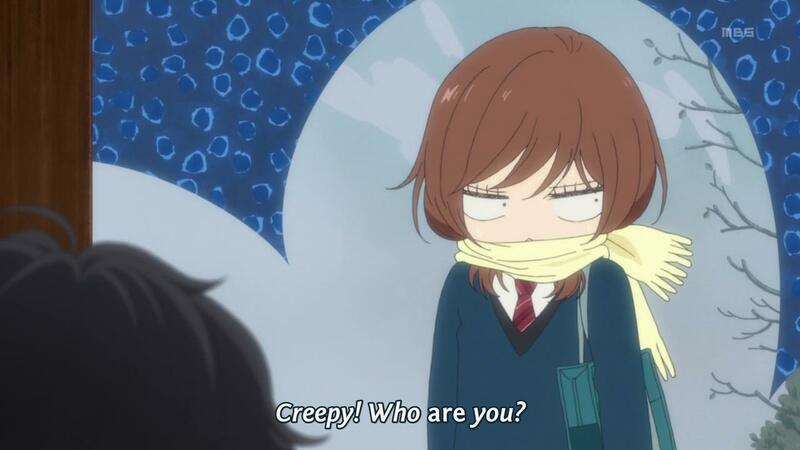 The most common topic that seems to come up when I read other people discuss Ao Haru Ride is that the anime is a straight-up, standard shoujo series with the implicit implication that this is a lesser series because of it. I’m all for a series the tweaks or deconstructs a genre but these are not inheritably better than a well executed show done in a specific genre and Ao Haru Ride is a fantastically made series. Beyond all the positives I’ve already mentioned there’s also the above average animation, pleasing animation style, delightful soundtrack, and very good vocal work by the seiyuu (Maaya Uchida as Futaba and Yuuki Kaji as Kou to name two). I recommend giving Ao Haru Ride a chance to those that haven’t seen it yet, just don’t come to it expecting to be blown away – it’s a character driven series focusing on normal people in a normal setting – and works as a nice counterbalance to the other series of the season. I’m so glad you decided to check out the anime! Thinking about it, this is the first manga I’ve read from the beginning (as in waiting for chapter 2 to come out). It becoming an anime is a very unique experience. I haven’t read the chapters the anime is currently covering since they initially came out, but the portrayal of the characters and the loyalty to the art has been very satisfactory. I’m intrigued to see how they end the anime (it’s one cour, right?). Your predictions and interpretations are interesting to read whilst knowing what’s to come. @Nicole: I’m glad you’re enjoying it as well and thanks for not spoiling the future but now I’m curious to see how badly my predictions and interpretations are. I’ve already started to worry about what the anime can accomplish in only one cour since it feels like it has the story to go on much longer. Hopefully the animators will give some sense of closure to the anime. I think it will work out well:) there are a couple points in the manga where it almost feels like it could’ve ended, then wait! Plot twists. I had a pretty good idea of where it would end, but that was around chapter 20ish, so I’ve changed my mind about that. I’m tempted to go reread the earlier chapters so I can have a better idea. I think, however, I’m going to be content with my faulty memory and watch it anew! We shall see what comes of it all.